Fiber Laser Marking Machine (G-10-20W) has solid and stable Section Integrated Elevating Frame and Full Aluminum Workbench Plate that make it resistant to shocks and heavy loads. It is widely used in the electronics separation components, integrated circuit, electrical engineering circuit, mobile communication, hardware, tools, kitchen wares, tool fittings, precise apparatus, eyeglasses and clock, computer keyboard, jewelry accessories, plastic buttons, water heating fittings, sanitary ware, PVC pipelines, medical apparatus and packing container etc. We are a well-known Importer, Supplier and Exporter of Fiber Laser Marking Machine (G-10-20W) from Ahmedabad, Gujarat. 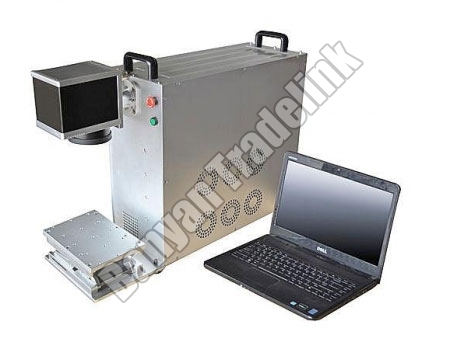 The Fiber Laser Marking Machine (G-10-20W) that we offer is known for its integrated design, compact size, low power consumption, longer functional life, high efficiency and low maintenance.